Sultan Teaser is breaking all records. No other Bollywood movie teaser has received this much love in digital world. After the 'Sultan' poster that showed Salman ready to take on his rival head on in an akhada aroused expectations, the teaser takes the hype to an all new level. Directed by Ali Abbas Zafar, the film stars Salman and Anushka Sharma in the lead roles. Salman is playing the role of a wrestler named Sultan from Haryana. The teaser looks vibrant, loud and rocking and we cannot wait longer for the film to release. 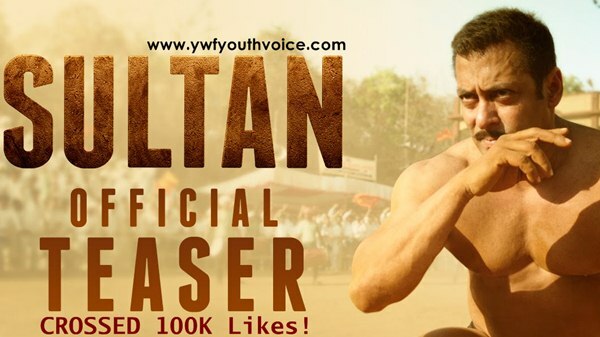 Teaser is breaking all records: It managed to gain fastest 50K likes in 24 hours and now it has crossed 100K likes. No other Bollywood movie teaser has received this much love in digital world.